Incredible String Band legend Mike Heron flies into the Trades Club on Wednesday June 3rd for a rare live performance with his daughter Georgia Seddon. Mike Heron and his Incredible String Band collaborator Robin Williamson virtually created British folk music with a series of groundbreaking albums before splitting in 1974. Mike’s classic solo album ‘Smiling Men with Bad Reputations’ was produced by Joe Boyd featuring a one-in-lifetime stellar cast from the rock aristocracy including Pete Townsend, Richard Thompson, Jimmy Page, Stevie Winwood, Keith Moon, Dave Pegg and even Elton John. “In the last few months The Trades has been lucky enough to have booked both Mike Heron and Robin Williamson who between them invented the British folk movement,” Trades Club spokesperson Paul Clarke told the Hebden Bridge Web. Twinkles Fortuna brings the Hello Sailor! burlesque troupe back to the Trades on Friday 29th May for another night of cheeky fun and frolics. Hello Sailor returns to port with a voodoo/vaudeville theme and burlesque sirens Daisy Cutter, Nelly Plum and Doctor Dei will jump ship to lure you into a world of strange and curious cabaret performances from the dark side. Support comes from the incredible Harrison Richards reviving the ancient art of mind reading and cutlery bending as well as DJs playing rock ‘n’ roll, rockabilly, surf, jive and swing. Steve Tilston has brought in some of the best folk around over the last year and John Smith is another top flight booking on Thursday 28th May. Smith was called ‘the future of acoustic guitar music’ by folk royalty John Renbourn winning him a support tour with the late, great John Martyn. John’s unique guitar style sees him use his acoustic as both a melodic and percussive instrument winning him standing ovations from the folk purists. John’s warm lyrics, unashamed romanticism and masterly storytelling won him rave reviews for his debut album 'The Fox and the Monk' which many folk fans rated as the best album of 2008. Into the Valley is one of the newest club night at the Trades using their connections in Manchester to bring cutting edge DJs over the Pennines and on Saturday 30th May they host drum ‘n’ bass pioneer Marcus Intalex. Marcus is one the godfathers of drum ‘n’ bass with his trademark liquid mix of deep electronics mashed up with dollop of soul and groove. Marcus always throws a few surprises into his idiosyncratic sets tossing in anything from techno to dubstep as well as his usual slamming drum ‘n’ bass. High quality live support comes from Silverclub aka underground electronic producers Duncan Jones on vocals/guitar and bassist Tommy Walker III. They played a storming set at Manchester’s In the City Unsigned that led to an appearance at the Glastonbury Festival last year. Into the Valley resident DJS Flash Atkins from Paperecordings and What the Freak’s Chris Price will be holding it down with deep disco, cosmic house and whatever else gets a shuffle on. 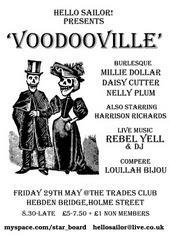 “Dita Von Teese has made burlesque hugely popular in the cities so we’re delighted the Hello Sailor Crew are bringing some of the best performers from across the North to Hebden Bridge for a night of cheeky fun,” Trades Club Spokesperson Paul Clarke told the Hebden Bridge Web. “John Smith is a huge booking for us as he is rated by everyone on the folk scene as the best young acoustic guitarist in the UK and his new album shows he can produce some spellbinding songs as well.